In order to benefit of the ski lift both in summer and winter, the city is implanted at the foot of the skiing plateau and extends westward into the hillside in order to preserve as much plain in its natural states as possible. 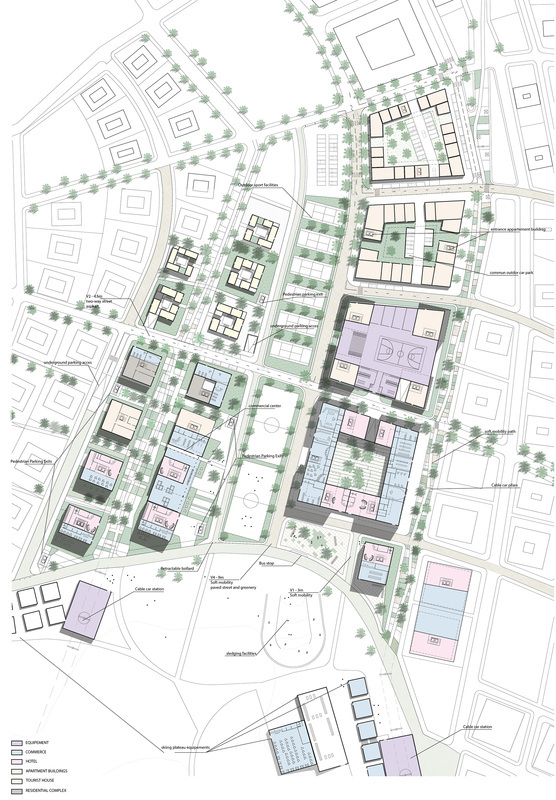 As this plain is serviced at is two end points, the projects also plan to build two gateway permitting simultaneous the access and the storage of the goods without having to access to the city. Each of these pole has a density significantly different. Their mountain morphology (the variation of the building height) came from the studies related to solar constraints and energy efficiency. 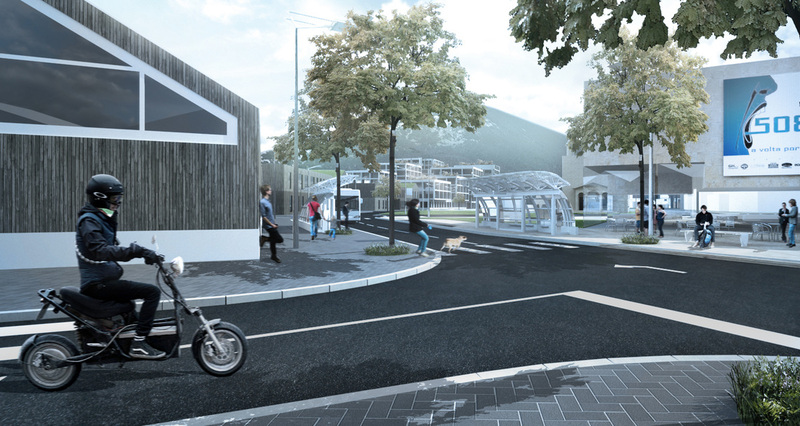 The transport network is divided in three stage, A main road leading directly from a multimodal platform to the other at each end of the site. From this, a secondary road network parallel to the mountain topography allows the distribution of the islets. Perpendicular to it we find a network dedicated to the soft modes of transport facing the mountain that provides an easy to the skiing plateau. Like that the soft modes of transport network is protected from the road. Location : Bosnie-Herzegovine, Highest peak Velika Klekovaca, at 805 to 895 metres above sea level. For this competition, the bias was to design an urban pattern generated by tools for parametric programming. The urban grid, the study of heights and typology of housing are the optimized results from simulations between a 3D parametric design software, and software for environmental analysis. All data as solar radiation, natural lighting condition, thermal performance and water consumption have been integrated to the urban design from the beginning. A urban grid with 20/20m plots - 10m spaced -, is at first uniformly contorted to have the optimize pattern following the contour lines on slopping fields. 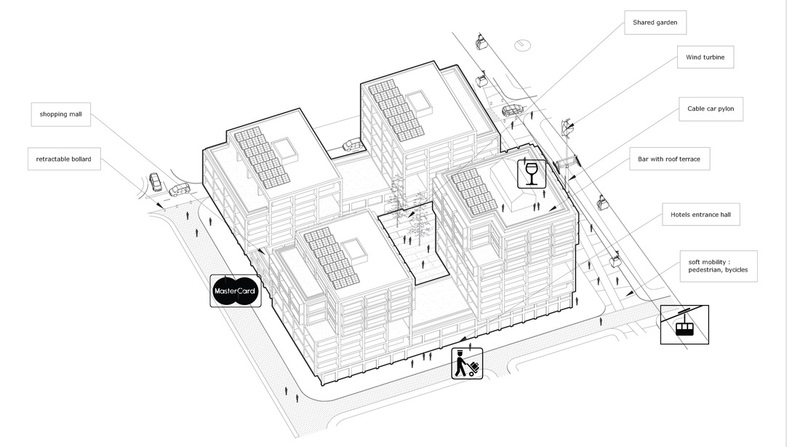 The simulating of solar potential generates two progressive areas of highest building. 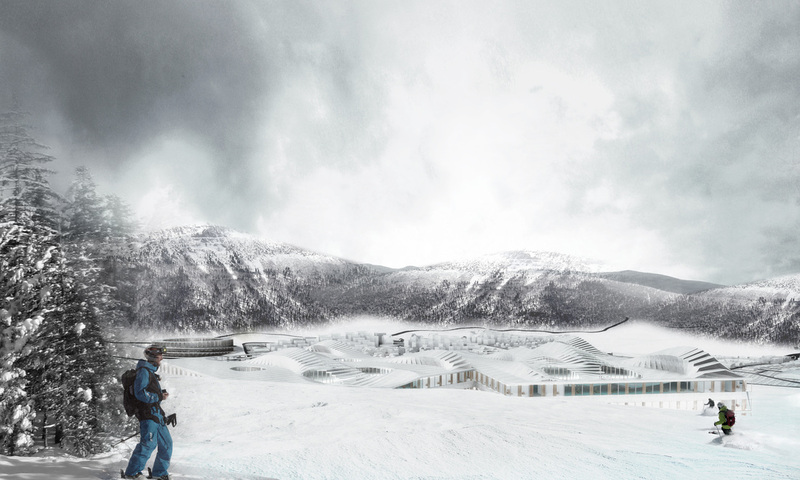 It defined two urban attractive areas, each one will be specially focused on winter activities or summer activities. A last parametric control working on plots morphology, define the optimized housing typology and zoning area. 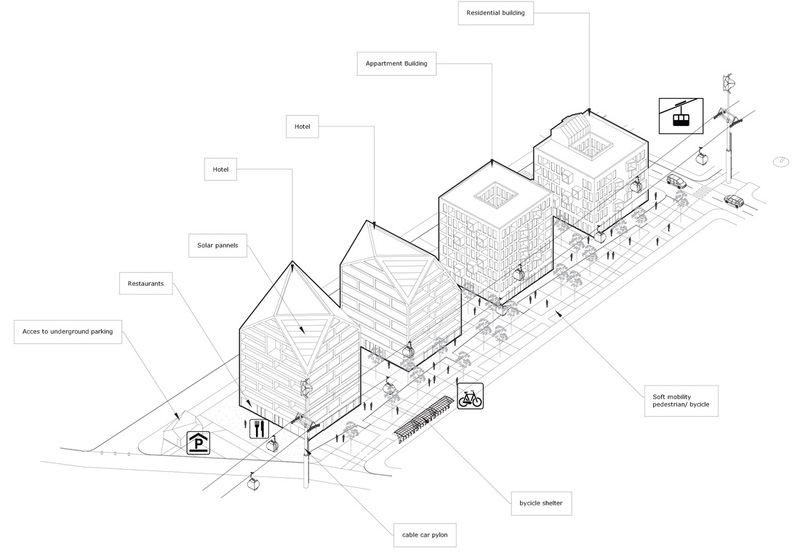 The linear morphology of the city allows a construction in three successive phases both consistent and do not creates disturbation for the functioning of the existing infrastructure. 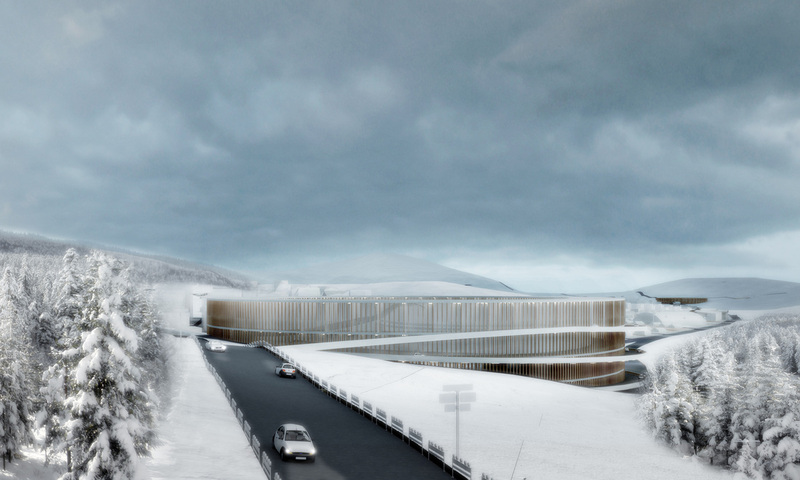 While the first phase focuses near the skiing plateau and is oriented from the north to the south, the following phases extend the city toward the multimodal hubs and gives the city its orientation. According to a report about goods delivery on the skiing stations in the Alpes « Transport de marchandises à destination des stations de sport d’hiver des Alpes du Sud « written by R. Leclerc. The biggest issue for these kind of cities is the goods management to supply the city. As resellers need to import most of the goods there is an important lorry traffic. A way to controle and minimize it would be to store the most part of the non-perishable goods and mutualize the delivery of goods in one place at the entrance of the city. After studying this report we came to the conclusion that this city needs a multimodal platform. 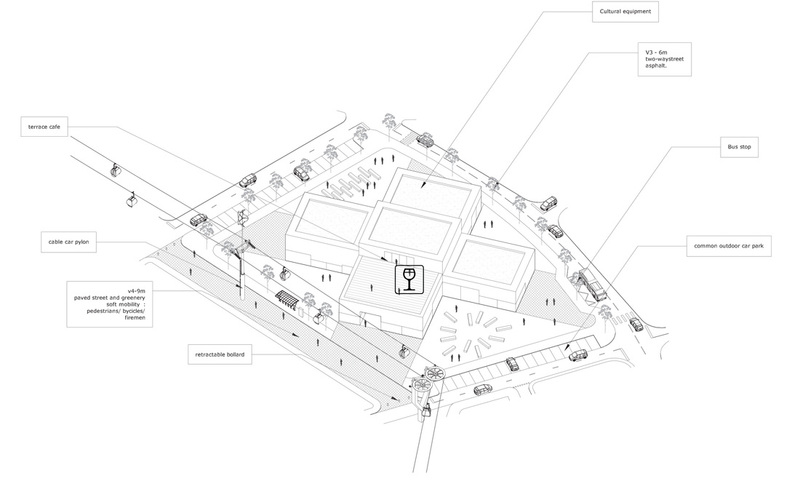 Taking into account the topographical, flows constraints, the needs of parking and storage, we decided to design at the entrance of the city a building that will manage all these points. This building has three major functions : to reduce 40% of the circulation inside the city ; to create an access between the city and the road by reaching the level difference of 15 meters between them ; to sort out the different urban traffics and flows of person and goods. The building is designed with a circular shape of four storey. The lower storey is used for the traffic of the trucks and storage of the goods. The storage have a direct connection with the cablecar station by lift. The first level is a parking of 850 places for tourists and daily users of the city. From this parking you have also a direct connection to the cable car station or bus station. 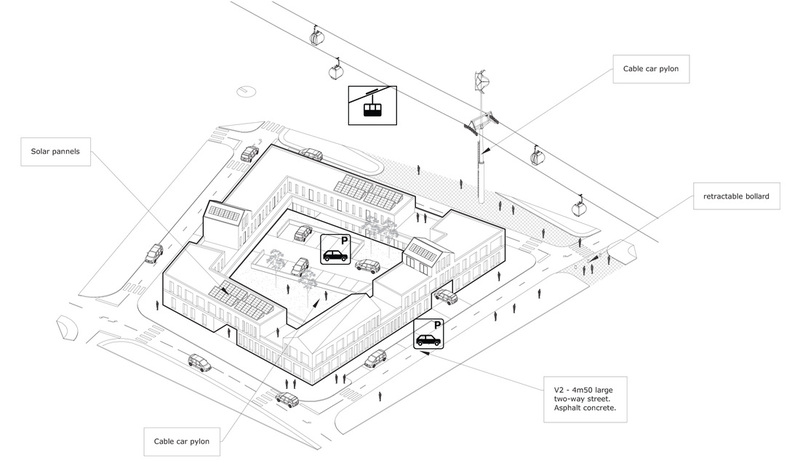 The third level is composed of a parking of 150 places for people working in the multimodal platform, production facilities connected to the storage by lift and the cable car station. The last level is dedicated to the office and administration of this logistic platform. This platform not only manages with the flows entering the city but also those coming out. With a pneumatic system, all the wastes produced in city arrive directly in the platform and are then carried to the closest treatment central. During the site the site of the city the multimodal platform become a place for the storage of the building material that will be carried into the city through the cable car. The bias of the programmatic organization is to group the activities of the hotel together with the health resort in one building. The extension planned on phase is a second building connected to the first one, allowing a full functioning of the first building during the construction of the extention. 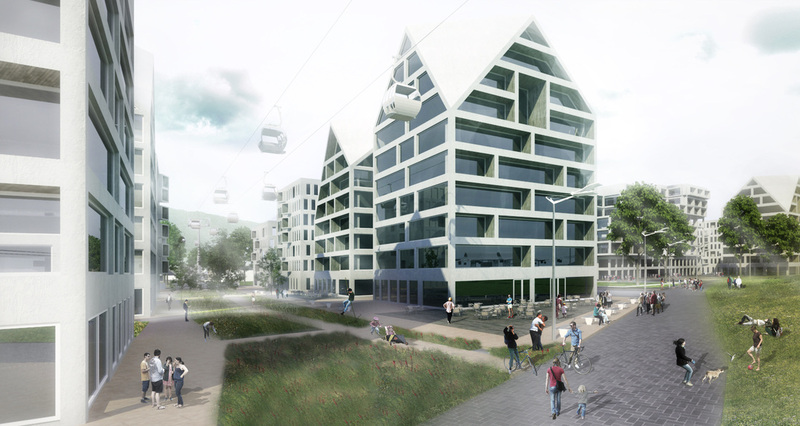 The arrival of the visitors to the Health resort is emphasized with the cable car coming directly into the heart of the building. This system allows the health resort area to remain entirely pedestrian. Cable cars are also used to carry goods from the multimodal platform. The hotel levels are located under the health resort. On each of them an intimate piano bar, restaurant or swimming pool is planned in addition to the main public facilities on the arrival level. External recreational spaces are developed behind and above the building. The health resort it-self is divided into six specific areas directly reachable from the entrance hall : the pools area extending to the external bath ; the treatment zone with massage and specific therapeutic treatments rooms ; A sport area consisting in a large equiped sport room and secondary rooms for yoga and thai shi classes ; a consultation area where with specialist doctors and therapist.